Named after a little creek that runs just south of the distillery, the same creek that ran by Abraham Lincoln's boyhood home in Kentucky. OK, we got a bit carried away here. 1) Why is ‘Bourbon’ not a whisky? The Bourbon industry strict set of rules refer to manufacturing method rather than location. Most important rules: Bourbon must be matured in new and charred casks of American white oak. No colouring or flavouring of any type is allowed. It must be matured for at least 2 years, if a bottle does not bear an age, it is at least 4 years old. The mash bill must contain at least 51% corn. 2) The temperatures of the American warehouses are much higher, so the pace of maturation is much quicker for Bourbons than for Scotch Whiskies. 3) Bourbons are very high in vanilla, as American White Oak is naturally high in vanillins. Knob Creek 9 Year Old (the brand is owned by Jim Beam which was first introduced in 1795) is hand-bottled limited quantity Bourbon, created to represent whiskey before it was mass produced. That’s why it embodies the look, feel and taste of pre-prohibition Bourbon. It is bottled at an honest 50% abv proof like all good Bourbons were a century ago. It is aged nine years in in charred American white oak, giving it the distinction of being aged the longest of the small batch Bourbons. This extra aging allows it to absorb more of the sugar and vanilla in the wood, giving it a slightly sweeter taste and nose. What does Knob Creek Straight Bourbon taste like? The Flavor Spiral™ shows the most common flavors that you'll taste in Knob Creek Straight Bourbon and gives you a chance to have a taste of it before actually tasting it. Copper, with glittering orange highlights. Roasted nuts, fresh oak, burnt sugar, maple syrup and raisins. Full-bodied, sweet, woody, almost fruity, with cocoa, sweet maple syrup, caramel candy, wood resin and spice (cinnamon, clove, licorice). Long and glowing. Dry, oily, cocoa balances out vanilla. A classic top of the range hefty Bourbon, which grows on you after each tasting! Vanilla, spicy, sweet, burnt caramel, oak, brown sugar, maple syrup, charred, syrup. I rather enjoyed Knob Creek neat. Very tasty but it is strong so be wary. It's not for beginners. Knob Creek is a first choice for a mixed drink. Good flavor and smooth it makes a great old fashion I will keep a bottle in the home bar. Start- 5/10 Finish- 6/10 Flavor- 7/10 Unique- 5/10 Overall- 5.75/10 Wonderful in a whisky sour. A bit harsh of a flavor profile to drink straight, but the strong flavors can be harnessed properly when mixed. Solid mixing bourbon. Nice aroma with vanilla being very prominent but the taste was too spicy it hid other flavors so had a hard time enjoying this one. Good solid bourbon, burn is a little stronger than expected for ABV, feels more like a cask strength. Great flavor! Smooth. This is my go-to drink most of the time. Love it, Smokey, Full bodied with a real nice finish. my favorite bourbon overall so far. smooth and easy-drinking for the price-point. This is what got me in to whiskey, smooth. It's what I base all Bourbons off. great drink. the 120 is harsh and needs to be cut. Get the spice immediately, but not a lot of burn to follow. Very smooth, sweet. One of the best values out there. Not bad. Bit smoky, fairly sweet. But hard burn. Lot of spice and good proof for a daily dram. Sweet and smokie. Almost too strong, but not uncomfortable to drink. Good sipper. Better than the bottom shelf stuff but nothing that will blow you away. Pretty smooth, good for the price. smell is good strong oak. Sips heavy bite with oak/smoke/vanilla. My all time favorite go to. Nice aroma. Good taste with a little bite. Smooth finish. It’s my go to bourbon, like that it’s cheap. But doesn’t taste cheap. I never get tired of knob. I've always enjoyed Knob Creek 9 year. It has a solid flavor that I enjoy. I always drink it straight up however, tonight I decided to add a splash of water. I think it did help bring out some flavors. One of my new favorites! Very smooth! The burnt caramel takes a front seat in this. Almost tastes as if the corn took a bit too much heat. A light nose, no bitterness. This bourbon is slightly redeemed by the fruity and sweet flavors that emerge on the palate. Would sip on if given for free, maybe even at a happy hour price, but would not buy a bottle, especially at a $40 price point. Definitely tastes of a $20-$30 bottle. Sweeter and smoother than most bourbons. It beats my previous favorite Bulleit 10 year by a nose. Sweet carmel aroma. Starts sweet then you get the bite and slight bit of smoke. Massive notes of vanilla and caramel on the nose. Flavors pack a big wallop of vanilla, molasses, and spice. Long, warm finish. Punchy and assertive, there's nothing subtle about this, but it's great fun- a very 'elemental' Bourbon. Very solid bourbon. In my humble opinion, it needs a little ice to round of some sharp edges. Was good drink. Liked it a lot ..
Knob creek was excellent. Smooth flavor. Will purchase again. Enjoyed very much. a bit strong for my taste. Been drinking this since last summer and it just keeps getting better. This is my go-to when I want a drink. This bourbon ranks high on my list of favorite thus tasted. I'm reserving spot "10" for a bourbon that goes beyond anything I've ever had. 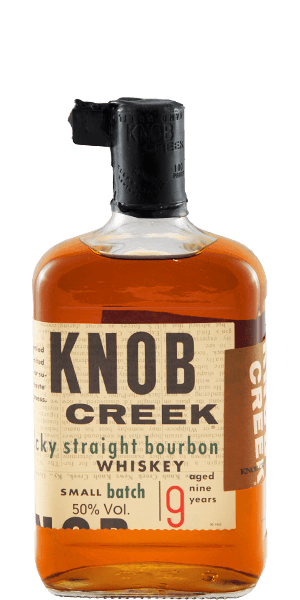 I had already tried this Knob Creek and knew I liked it. I also like adding one Bada Bing dark cherry! Anyone bought a bottle lately? Still have the age statement? The oak and maple really shine through. Smooth drink. Good choice for weekly drink or two. Great flavor with a little bite, great with an ice cube or two. It's warm, but smooth. Easy to drink. Great all around for the price! Love it great Bourbon, especially for the cost!! Vanilla flavors and the smooth long finish. Don't like it. Surely a well made Bourbon, but I don't quite like the taste. Vanilla and toffee. Lingering finish bit strong with the alcohol taste. Not much bite but the flavor doesn't do much for it. This is my usual standby when I don't know what else to get, love it!! Most favorite bourbon. My go to. I really enjoy the sweet start, the finish is one of my absolute favorites . This is 120 proof, but as smooth as an 80 proof. Not in my taste profile. Smooth please keep them coming. Smooth drinking, full bodied, complex in palette, temperature changes the prominent flavor; a bourbon well worth the buy whether you're an enthusiast or expert. A hearty go to bourbon that packs a kick.